With instant communication from Radio, Telephone, and Television – technology constantly grows to automate this vast network. With instant communication available each day we not only get information faster, we are inundated with information. How are we supposed to deal with all of this information? We invent computer machines that think, that store, sift, sort, and count, that help us chart our course through an age of boundless information (Larry Dobkin script). We move from analog to digital in order to maintain our vast network as depicted in a generic Network Operations Center (NOC). 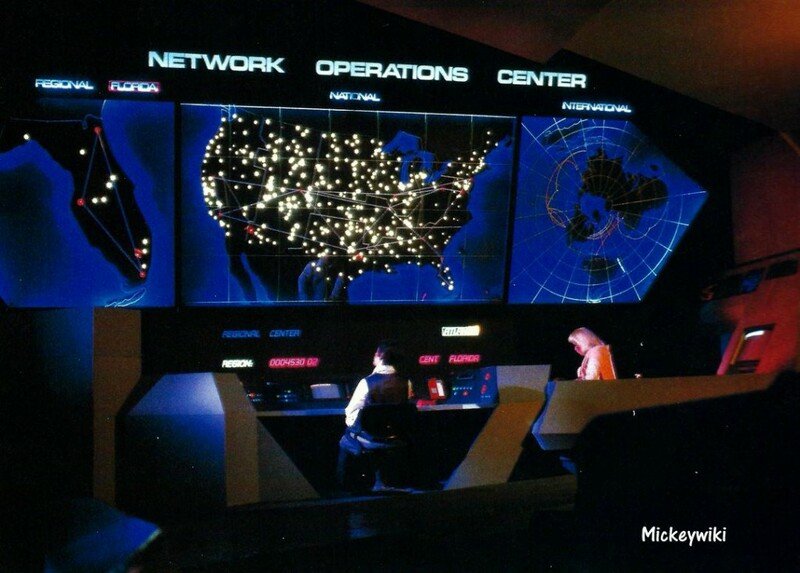 In the first incarnation of the ride, there was nothing on the left that I can find evidence of before arriving at the Network Operations Center (the NOC). I remember there being SOMETHING on the right side. You can see glimpses of it in MartinsVids with a woman reviewing three large monitors. 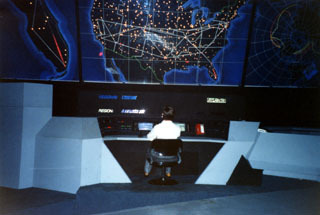 The NOC scene shown below was to the left and showed three large lit up maps (Regional/FL, National/USA, and International) to monitor network operations. Two network managers (male and female) are working the console likely studying traffic trends and service levels. The very first version of the NOC has no branding and the man at the desk is wearing a vest that reminds me of Han Solo. 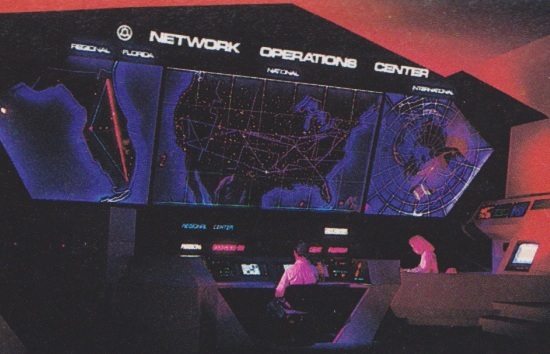 A later update added in the ride’s sponsor’s logo, Bell Systems to the NOC and removed the dude’s vest. 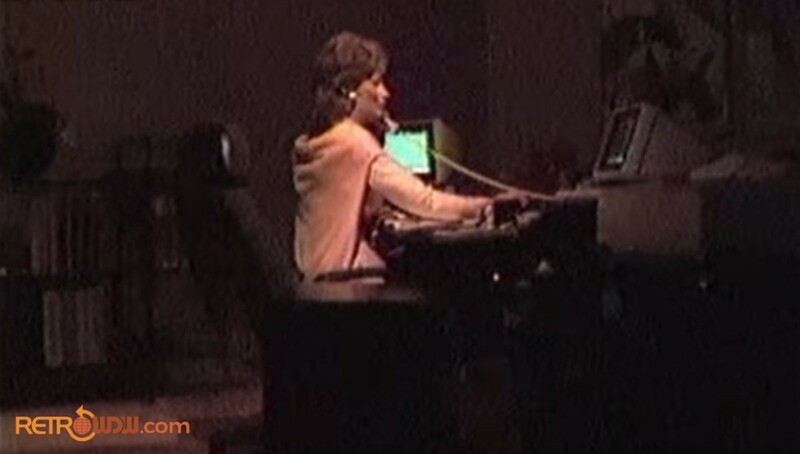 By the Cronkite era, the left side was updated to include a few animatronics and the introduction of the personal computer before the NOC Scene. The technology for the personal computer was created along side the electrical engineering technologies that brought us the communication inventions we’ve seen so far in this ride. Cronkite mentions that computers were made possible by the tiny transistor. The transistor was invented in 1947 and its purpose is to amplify and control electronic current direction and serve as a switch. 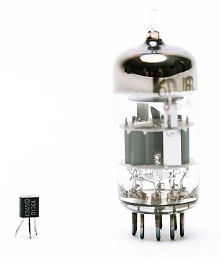 It was certainly tiny compared to the vacuum tube that predated it. It allowed for more compact computing and received the Nobel Prize in Physics in 1956(1). Nothing really captures the excitement of the transistor better than this video from 1953! In 1959 Kilby (Texas Instruments) and Noyce (Fairchild Semiconductor) saw that there needed to be a better way of building and connecting transistors in large quantities. They invented the integrated circuit – a conductive circuit board on a chip that contained many of the tiny transistors (1). This work led to a Nobel Prize in Physics in 2000. In 1971 Marcian Hoff of Intel Corp invented the microprocessor that put the entire central processing unit on a single silicon chip. In other words, all functions of the computer are placed on a single integrated circuit (1). 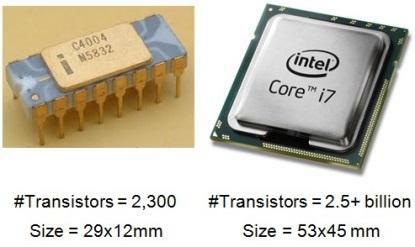 This microprocessor had a transistor count of 2300 transistors (2). As of 2016, the largest transistor count in a commercially available single-chip processor is over 7.2 billion (3)! Now that computing power can be put on a chip the production of personal computers was made possible. The first personal computer to achieve great commercial success was the Apple II in 1977. 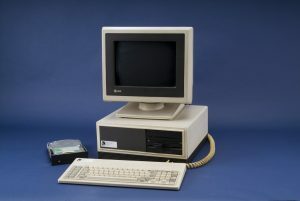 In 1981 IBM came out with their model which included a hard disk drive (3). 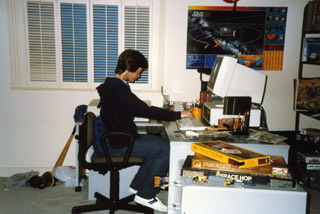 The first of the new scenes shows a young man at a desk in his bedroom working on a computer. From watching the Martins Vids videos of this scene its not clear exactly what he’s working on, but perhaps he’s playing a game since there are three board games (Chess & Checkers, Parcheesi, and Space Hop) to his right on the filing cabinet. Computers weren’t a staple in homes till later in the 80’s and were usually in a shared space for the family so its hard to say when in time this scene represents. Since in 1986 AT&T was the sponsor, this guy is likely working on an AT&T PC 6300 which came out in 1984. 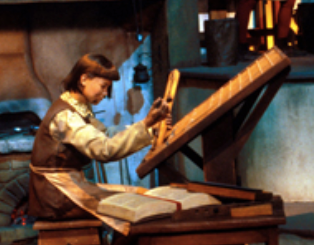 According to the fine folks at Retro Disney World Podcast the young man at the computer was the original composer from the printing press scene that departs and is never replaced. Perhaps he’s still doing data entry like he was in the 1450’s! 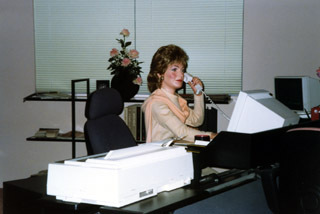 Further ahead on the left a woman sits at her office desk, talking on a phone and using a computer. Its referred to as a Paperless Office in some texts even though there is a dot matrix printer on her desk. Given that it was 1986 when this was installed, that was certainly the dream for the office of the future but this appears to depict the then current times of the 80’s. Computers seemed as though they would replicate the aspects of paper use, however – in short, new technology didn’t get rid of paper, it actually increased and/or shifted the way it was used (5). While email was becoming more available, electronic document transmission (attachments) were particularly slow to take hold. As the new ease of printing sent office paper use to record levels, a joke arose that the paperless office would arrive at around the same time as the paperless toilet (4). The woman in the “modern day office” in the last scene had moved over from her previous position at the Network Operations Center. That left the gentleman all to himself which must have been a challenge because there was also an organizational change from Bell to AT&T which renamed the NOC to the AT&T World Wide Intelligent Network. Of course today, it takes more than one person to manage the network, its actually 130 people who monitor tracking the daily movement of nearly 30 petabytes of data — including 1.4 billion voice calls and 5 billion text messages — as it travels through nearly 1 million miles of fiber-optic cable, tens of thousands of cell sites, and countless switches and routers (6). Instant communications create an ever-increasing flow of facts and figures. To manage this growing storehouse of information, we invent the computer. A revolutionary tool made practical by the tiny transistor. With each day come more paths, more ideas, more dreams, and we build new machines: computer machines that think, that store, sift, sort, and count, that help us chart our course through an age of boundless information. With these machines comes a wondrous new network of communications, a vibrant maze of billions of electronic pathways stretching to the very edge of space. Too much! Too many facts!! How can we sort them out? How to sort out FACTS? With COMPUTER Walls!! Walls that Accumulate – Organize – Store – Interpret – Retrieve and Transmit Information with incredible Volume and Speed.